Most of my time has been taken up with business writing lately, so it is great to have a few minutes to talk about the book I have just been reading for leisure. She was also a friend of my parents and attended their wedding in 1968. I found this book in a secondhand bookshop recently and was intrigued. 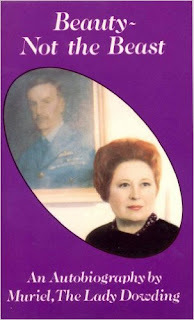 I was particularly intrigued to find that she had been a celebrity in her lifetime married to a man who was a mega-celebrity and credited with winning WWII from the air through his brilliant strategy, yet her autobiography had been published by a small press. I soon discovered why, A large part of it was devoted to her and Lord Dowding's interest in psychic matters, which is how they got together. As the young wife of an airman missing in action, Muriel was encouraged to contact Lord Dowding shortly after the war to see if he could provide any further information. He did and then proceeded to set her up with a psychic to obtain even further information. Finally at the behest of the spirit of the young man in question suggesting 'You should ask my wife out, You'd like her.' Lord Dowding invited Muriel to dinner and the grand romance began! Not satisfied with bucking metaphysical tradition, the Dowdings, once married, then took on animal welfare and the cruelty of vivisection, travelling the world to talk to vivisectors and getting involved in parliamentary acts and anti-vivisection organisations. In the course of this Muriel Dowding discovered to her horror that it was virtually impossible to buy even a bar of soap in the 1960s which had not been tested on animals and was chock full of animal ingredients. So as the original Anita Roddick of her day, she set about getting a coterie of well-connected female friends including Dr Barbara Latto (another friend of my parents) to join her and start producing cruelty free cosmetics with a clothing lines of fake fur called Beauty Without Cruelty - a brand that lives on to this day. I remember my mother when I was little sporting her fake Ocelot coat proudly with a badge bearing the legend 'Make No Mistake, My Fur is Fake! - Beauty Without Cruelty' in an era where women were embarrassed to admit they wore simulated fur and fake fur was simply seen as an alternative for women who couldn't afford the real thing, rather than for women with a conscience. Although an accomplished writer, Muriel's autobiography cries out for editorial intervention as random chapters about UFO's, the dangers of psychic attack and animal welfare vie with autobiography and guest chapters from admirers of her work and tireless stamina. It is a hotch potch, albeit probably one of the most riveting reads ever penned by a Lady. Sounds intriguing. And more so with the threads to your parents. A woman out of her time obviously. End Anti-black Prejudice Towards Cats!